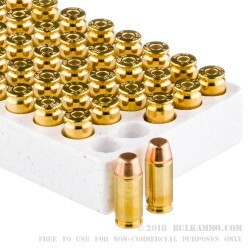 Made in America, this is 500 rounds of brass-cased .40 S&W ammo from Winchester. 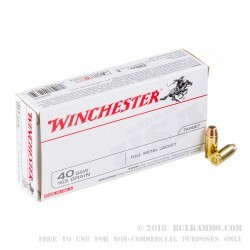 Winchester USA pistol ammo is made in Oxford, MS. It's boxer-primed and reliable stuff. Winchester actually worked with Smith and Wesson in the late 1980s to develop the .40 S&W round. 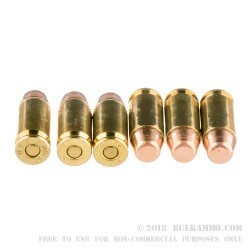 Each of these .40 S&W cartridges have a full metal jacket bullet with a weight of 165 grains. Winchester and Smith & Wesson have a very long history. In 1855 Horace Smith and Daniel Wesson were partners in a venture to manufacture the "Volcanic" lever-action rifle, and they incorporated the Volcanic Repeating Arms Company. Their shop foreman was famed gunmaker Benjamin Tyler Henry. Volcanic Repeating Arms Company's largest shareholder was then a major clothing manufacturer named Oliver Winchester. Smith and Wesson failed in this venture as the rifle did not achieve much commercial success and VRAC went bankrupt. Oliver Winchester and his partner John M. Davies purchased the assets of the defunct company to form New Haven Arms Company. Henry, still employed by the company, developed the .44 Henry round and then the Henry rifle of 1860 for New Haven Arms Co. 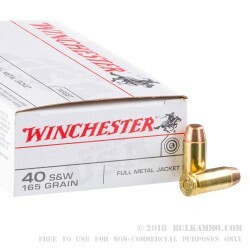 In 1866, amid a dispute with Henry, Oliver Winchester reincorporated the company under a new name: Winchester Repeating Arms, cementing Winchester as one of the most recognizable names in American gun history. Review by Jeff C. P.C. FL.